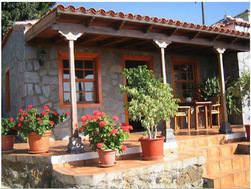 Casa Minerva is a beautiful Canarian House situated on a finca of fruit trees and manicured gardens. Located just 1km from Tijarafe in the west of La Palma, it's a quiet and relaxing place to spend your holiday and yet close to amenities. The accommodation comprises a lounge/dining room with fully fitted kitchen, twin-bedded bedroom and a bathroom. 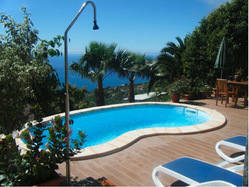 The house has two terraces with garden furniture, BBQ and private swimming pool. The lounge has satellite TV and there is also free internet connection. The bright and spacious kitchen provides a fridge freezer, microwave, vitro ceramic hot, coffee maker, toaster, kettle and juice squeezer. There is a also a washing machine. 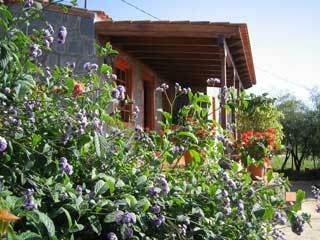 At Casa Minerva, you can also enjoy the stone-built BBQ and take a wander in the orchards. From the owners: In the spring of the year 1996 we began our journey in rural tourism. We had restored a small and humble house where Minerva was born and lived during her childhood. It was a dream, an illusion that she shared with her partner. Years later, in 2005, an industrial accident prevented Agustin to continue working at his trade of Carpenter. Looking for a exit to this situation and moved by the passion of the rural tourism sector had aroused in us, we decided to rehabilitate an old building and turn it into a lovely cottage, Casa Minerva. Infected by our experiences, our son Diego joins the project and provides an apartment in Los Llanos. Our motto is to offer the visitor what we like to find us when we travel: Tranquillity, comfort and cleanliness. This is guaranteed. We are always willing to help, orienting and informing our clients to make their stay as pleasant as possible and have memories of your holiday.